Average Weight	: 15 - 17 lbs. The Lakeland Terrier breed dates back to the 1800s and is one of the oldest terrier breeds that is still around today. The breed was originally used in farming communities to keep the areas around buildings and farms free from vermin, as well as for hunting and as a watchdog. As fox hunting became a more common sport the breed really gained in popularity for its feisty and energetic personality as well as its ability to go through dense underbrush and chase foxes back out into the open for the hunters. Gradually the working and sporting dog evolved into the companion dog that it known as today. It hunted den animals such as badger, fox and otter. It was able to hunt on uneven terrain, woods, fields and water. It chased and killed the quarry. It is still used for hunting, as a companion and as a show dog. The Lakeland Terrier was originally bred in the Lake region of England as a ratter and fox hunting dog. The breed has been developed through the selective crossing of several breeds including the Old English Wirehaired Terrier, the Bedlington Terrier, the Border Collie and the Dandie Dinmont Terrier. Originally known by one of several names including the Fell Terrier, Eltewater Terrier and the Patterdale Terrier, the name Lakeland Terrier was officially recognized 1921. The Lakeland Terrier quickly became a popular breed in the United Kingdom and then became recognized by the American Kennel Club in 1934. The Lakeland Terrier is still used in hunting trial and in agility and obedience competitions and events, making it a very versatile breed. The Lakeland Terrier is a small sized terrier breed with a jaunty look and an intelligent expression. The Lakeland Terrier, like most terriers, in an adventurous and energetic breed of dog that loves to spend time with its family. They are naturally very intelligent dogs and will be relatively easy to train with almost any type of trick or routine. Sometimes Lakeland Terriers can be challenging to housetrain but will learn quickly using crate training techniques. The Lakeland Terrier prefers to be with people rather than to be isolated or left alone. They can tolerate being left alone for short periods of time but are not a good breed when the family will be gone more than they are home. The Lakeland Terrier can find ways to entertain his or herself, but they can become destructive or problematic when bored or lonely. Usually this is displayed by digging behavior or barking. Regular exercise, lots of toys, companion dogs and time spent with the family will usually correct these problems should they develop. The Lakeland Terrier is wonderful for families with children of all ages, although they can be somewhat protective of food and toys. They love to run and interact with people and can be excellent companion dogs for non-canine pets and other dogs provided they are properly socialized. A natural hunter, the Lakeland Terrier will chase but not as much as some of the other terrier breeds. The Lakeland Terrier loves to be challenged with new activities and new places to explore and investigate. They often will find new and different ways to play with toys and to interact with people. The Lakeland Terrier is an affectionate dog but not one that will sit around for long periods of time. The breed will naturally want to be a part of everything that goes on in the home. They love to keep track of everyone in the house and will often spend time going from room to room just to keep tabs on the people in the family. If there are other pets in the house the Lakeland will often initiate play or chase games and is always up for romp through the house. Since the terrier will self-exercise it is considered a good breed for people in apartments or individuals that are not able to provide regular, long exercise in the form of walks or runs. One of the many positive attributes of the Lakeland Terrier is its nature to provide protection for the family. They are very courageous and will bark and give notice of strangers and strange animals that approach. With proper socialization and training the Lakeland Terrier will quickly learn to stop barking on command and accept new people and animals. Typically the breed is rather wary of strangers but will soon get to know new people and accept them. They can be somewhat dog aggressive if not properly socialized and males tend to be more aggressive than females. Proper training, early and varied socialization and neutering and spaying will prevent much of the aggressive type behaviors. 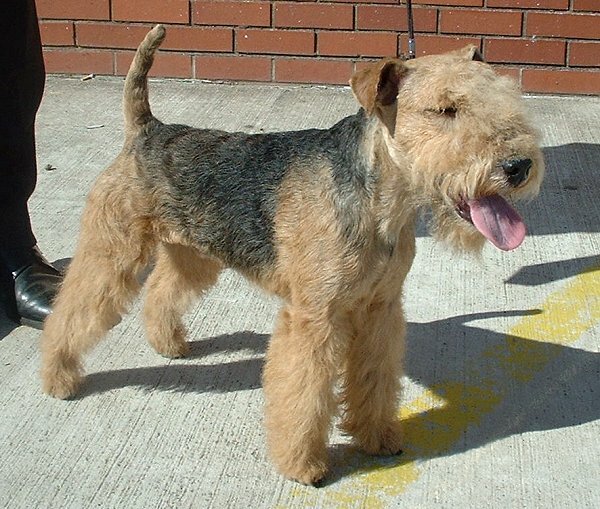 The Lakeland Terrier is a wire coated breed that needs little in the way of intense grooming. Typically all that is required to keep the coat in great condition is brushing every two or three days with a stiff bristle brush or a pin brush. The hair around the mouth is prone to staining, so wiping the beard on light colored breeds after eating will prevent this from happening. Two or three times per year the dead hair will need to be removed by plucking or stripping. This is an easy process that owners can easily complete on their own. Stripping or plucking involves grasping the longer, dead hair with the fingers and then pulling out in the direction of the growth of the hair. This is a non-painful process for the dog and will prevent infections and matting that can occur if dead hair is left in the coat. For shaping the hair around the face and the body for showing more specific types of stripping can be completed to give the profile required for the show arena. Clipping a Lakeland Terrier is not acceptable for show but many owners do clip the body and the legs to keep down grooming requirements throughout the year. The hair in the ear passages and between the pads of the feet should be removed whenever it gets long. The Lakeland Terrier is a low shedding breed and does not have the seasonal shedding problems that many other breeds experience. Since the terrier coat has natural oils for protection from water and dirt it is important to only wet bathe when absolutely necessary. This little dog loves to be outside and have time and space to run and romp. They are avid chasers and will play fetch with a ball as long as the owner is willing to keep throwing. The breed is very active indoors and can adjust to regular outdoor walks even if they are housed in a smaller house or apartment without a yard. Since they are a terrier breed they should be kept in a fenced yard as well as walked on a lead to prevent them chasing other animals while outside of the yard. In a larger fenced area they will self-exercise but may also dig if they become bored. The Lakeland Terrier is an ideal dog for family outings and travel. They don't need highly intensive exercise but can be excellent dogs as jogging companions. They make excellent agility and obedience dogs and are often used in trials and competitions. As with any breed of dog regular exercise is very important in both regulating weight and maintaining overall health. As with most dog breeds the Lakeland Terrier does best with consistent, positive training methods that include lots of socialization opportunities at an early age. The breed is very easy to train and highly intelligent and will quickly learn what you trying to teach. As with all terriers, the Lakeland can have a stubborn streak that needs to be firmly and consistently monitored. Usually Lakeland Terriers will become less compliant and stubborn if they have to repeat the same training routines and exercises in a repetitive fashion. Adding new twists to the routine and avoiding multiple repetitions of each particular command will minimize this problem. Occasionally the Lakeland Terrier can be difficult to housetrain. Crate training, which uses timing and positive rewards to take the puppy outside at specific times after eating, drinking and exercise will make housetraining much easier. Remember that lots of praise and attention for going outside is much more effective than punishment for an accident in the house. Leash or lead training is important for a Lakeland Terrier as they are natural chasers that can often dart out onto roads after other dogs, cats, birds or squirrels. Even though it is a smaller breed they don't require a harness, but this can be a good option for leash training. Socialization at the earliest ages is critical, especially if you have other pets in the house. In addition socialization will help with introduction of new people and new environments for the dog. Since the breed may be rather possessive of food and toys this needs to be a key focus in both socialization and training.